Ford Prefect competition prize in 1957. Homepage. This page: Who was the lucky winner who won a brand new 100E Prefect by entering this prize draw in 1957? Win a new Ford Prefect! Although by 1957 it was getting a little long-in-the-tooth, Ford's 100E range was still popular with buyers who wanted a 2 or 4 door small saloon for the local commute, even if still saddled with a sidevalve engine that could trace it's roots back to the 1930s (the OHV 107E wouldn't appear until 1959). Up for grabs in 1957, in support of the Moyvane & Knockanure Church Building Fund, was a four door 100E Prefect, top of it's range at the time. No doubt tickets sold well, although I wonder whether the lucky winner opted for the new 100E or the £400 cash alternative? Second prize was £50, third prize £25, fourth £15 and fifth £10, or enough to buy a dog-eared pre-war Model Y if you so wished!! The draw was set to take place on December 15th 1957, so someone that year would be having a good Christmas! I wonder if anyone reading this in Ireland remembers this competition, or even better knows who actually won the car? 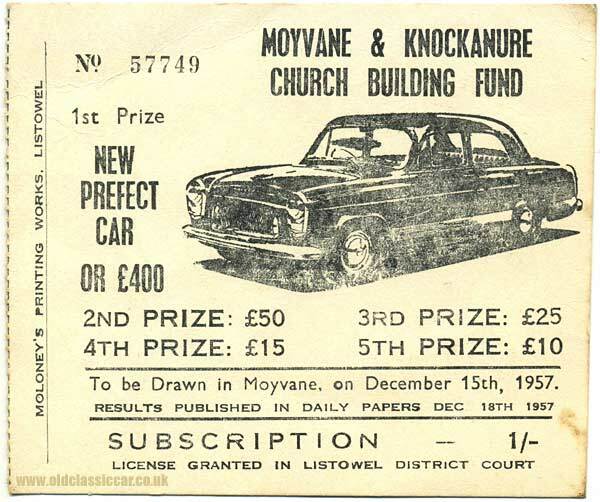 A little digging around reveals that the Moyvane church was opened in August 1956, yet this prize draw to raise funds for the church build was a year later, so perhaps there were still a few outstanding jobs required on the new building.